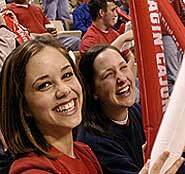 The University of Louisiana at Lafayette will host a Freshman Fair on Saturday, Aug. 12 to prepare students attending Louisiana state colleges and universities in the Fall 2010. Representatives from the Louisiana Board of Regents will discuss admissions requirements for all Louisiana state colleges and universities as well as a representative from the Louisiana Office of Student Financial Assistance to discuss TOPS requirements. The program will also include an informational browse that will allow students to gain more specific information from college and university representatives from across the state. The Freshman Fair is free and all upcoming high school freshman are encouraged to attend. Check in begins at 9 a.m. in the UL Lafayette Student Union, and the event concludes at 11:30 a.m.
Students interested in participating should RSVP by calling (337) 482-6553 or by email at enroll@louisiana.edu.